The Supreme Court of India’s Registry released an important Notification today regarding the Advocates-on-Record (AoR) Examination, 2015. 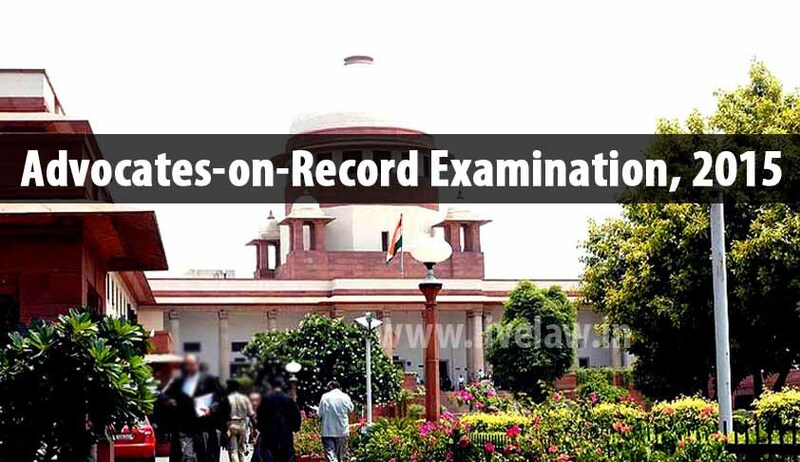 According to the Notification, this year’s AoR Examination will be held in the Supreme Court premises in New Delhi on 26th, 27th, 28th and 29th of May, 2015. Interested candidates should send their applications, which must reach the Secretary, Board of Examiners by 27th April, 2015 after which no application shall be accepted. The candidates can obtain the Application Form from the Office of the Secretary on any working day during the office hours. According to clauses 2 and 4 of the Notification, only advocates who would have completed one year of continuous training on or before 30th April, 2015 and who produce the requisite Certificate of training from an AoR shall be eligible to appear for the Examination. In this context, it may be noteworthy that a Special Leave Petition filed by the Supreme Court Advocates Association against the judgment of the Delhi High Court in Balraj Singh Malik v Supreme Court of India through Its Registrar General (AIR 2012 Delhi 79; decided on 13th February, 2012) that upheld the constitutional validity of the AoR system is still pending in the Supreme Court. The petitioners have averred in the petition, inter-alia, that the AoR system is unconstitutional as it violates the fundamental rights of other advocates guaranteed under Articles 14 and 19 (1) (g) of the Constitution of India. In Balraj Singh Malik, the division bench of the High Court comprising of Acting Chief Justice A K Sikri (as he then was) and Justice Rajiv Sahai Endlaw had held that Section 30 of the Advocates Act, 1961 (1961 Act) was to be read with Rule 52 of the Supreme Court Rules, 1966 which preserves the rule making power of the Supreme Court under Article 145 of the Constitution. Hence, it was held that the apex court was empowered to establish and govern the AoR system without violating the Constitution and statutory law. Another significant aspect regarding the AoR Examination is the abysmally low pass rate that was recorded in the 2014 Examination. As per the records only 65 out of the 544 candidates who appeared for the 2014 AoR Exam cleared the same.